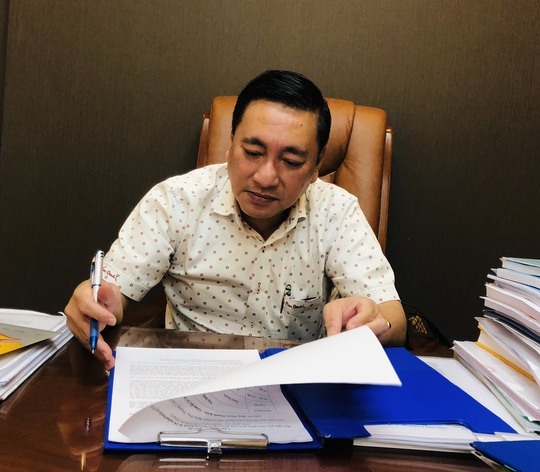 Phạm Thành Kiên, director of HCM City’s Department of Industry and Trade (DoIT), speaks to the Người Lao động (The Labourer) newspaper about the department’s work plan for 2019. How has the DoIT helped enterprises in recent years? Last year, DoIT launched many activities to develop supporting industries. These included consulting and training to help enterprises boost productivity so they can take part in supply chains; connecting enterprises with foreign suppliers; and building a key product portfolio for the city. There were also many activities to help enterprises overcome difficulties to improve production. We also continued our reforms on market stabilisation, and goods supply-and-demand connection programmes. We especially enhanced administrative reforms. Administrative procedures for level 1 and level 2 carried out by the DoIT can now be carried out online. The department has partnered with Payoo (an online payment platform) to allow customers to pay fees for administrative procedures online. It has also publicised on its website regulations on administrative procedures and the steps that applicants must go through in order to get the results of their applications. A number of administrative procedures are now provided online, including 109 level-2 procedures and 54 level-4 procedures. Last year, we launched the iSCT and SaleNOW apps which provide users information and interaction platforms with the department. What does the identification of key products mean to the development of HCM City’s industry sector? I can say that the mobilisation of resources to synchronously implement solutions for industry and supporting industry development has brought certain results, contributing to promoting industrial development in the city. In October 2016, the city People’s Committee announced the list of seven product groups, including products made from prefabricated metal (high-precision molds, super-strength steel structures, super-weight and castings, machine parts and components); electrical equipment products; products from plastic or rubber; processed food products (buttermilk, instant food, processed goods, seafood, confectionery, etc); beverage products; electronic products and information technology; and apparel products. These seven product groups will be the core foundation for other industries to develop, bring added value and contribute greatly to the city’s economy and to realising the goal of turning HCM City into an economic centre of the region. There are many doubts about the key products portfolio. What is your opinion? The key industrial products are produced by enterprises based in HCM City. They account for 54 per cent of the value of the entire industry, meeting domestic and foreign market demand, and can replace and compete with imported products. These are products that have added value, high labour productivity, innovative designs and preeminence; they are produced under advanced quality management systems and advanced and environmentally friendly technologies. They meet domestic and foreign market demands, have the ability to replace and compete with imported products and do not violate intellectual property rights laws. In addition to fulfilling the general criteria, these products also meet specific requirements of each industry and are proposed by industry associations. For many years, HCM City has identified four key industries, including manufacturing mechanics, electronics, chemicals – rubber – plastics, and food and food processing. The key products are built based on these four industries in order to promote branding for strong products of the city, and expand their markets both locally and internationally. The ultimate goal is to build a brand for HCM City. HCM City has many strong and good products, but consumers in the country are not aware of them. For example, the steel industry has exported products to more than 40 countries. The food industry has many enterprises that can compete with products from Thailand and other countries in the region. The household plastic industry also has many quality products. The city wants to build brands for the key product groups and implement many collective support solutions, but the key lies in the efforts of enterprises. The programme is only successful if the city supports it well and enterprises can take advantage of that support for investment and development. What kind of support is the city offering enterprises in these sectors? The support is very practical and addresses the actual challenges of enterprises. Specifically, the DoIT has just proposed to the city that relevant departments collaborate to implement policies to support enterprises in the key sectors. In particular, we focus on five groups of large solutions, namely capital, science and technology, training of human resources, trade promotion and brand building, and spaces in which to operate. Regarding capital, the Resolution 16 issued by the city’s People’s Council includes regulations on stimulating investment in the supporting industry sector of HCM City in 2018-20 tenure. It allows lending of money to enterprises at preferential interest rates to invest in facilities and technology for a period of seven years. The maximum loan for a project is VNĐ200 billion (US$8.6 million), an increase of VNĐ150 billion compared to the previous support level regulated under the municipal People’s Committee’s Decision 15. In addition, the resolution also clearly explains the shared responsibility in handling paperwork for enterprises. Regarding land, the rental prices of land is increasing, leading to an increase in investment costs, affecting investment in industrial development. This is a disadvantage for enterprises. So the city People’s Committee has given instructions on the formation of new industrial zones and at the same time establishing sub-zones for supporting industrial enterprises. In terms of science and technology, the city has assigned the Department of Science and Technology to strengthen support for development research policies, especially to promote more frequent linkages between the State, scientists and enterprises. Regarding training, we support training according to enterprises’ needs.